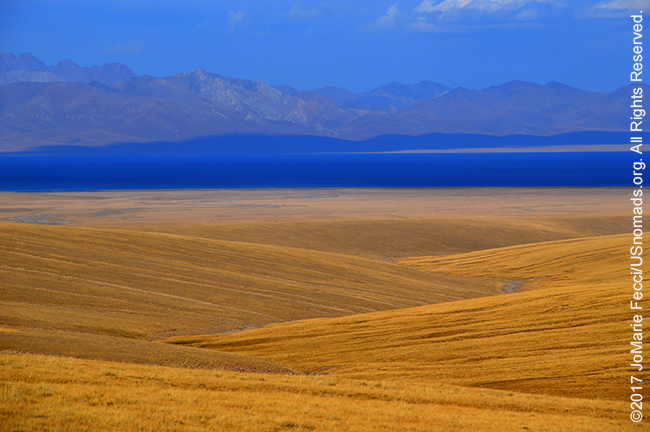 SONG KUL, KYRGYZSTAN — Woke up early and took a walk outside Katya’s place. I was staying with a local family in a “homestay” at the village, which is a great way to visit Kyrgyzstan and engage with the communities we are driving through. Though we had no common language we were able to communicate the basics and Katya was a wonderful host and a fabulous cook. I only wished we could have had a real conversation — the lack of language skills was frustrating for me as I could see we both wanted to carry on a longer discussion. After breakfast Katya and her mom saw me off with a few apples from her tree as snacks for later. Before leaving the village completely I took some time to explore. Kyzyl Oi is a fairly small village tucked in between the mountains here, and the river runs right through it. In fact Katya’s backyard opens up onto the water beyond a small patch of terrain her family cultivates. The sound of the river flowing in the morning before the sun came up over the hills seemed to echo. On the other side of the street a neighbor’s chickens cross a stream, and horses graze freely. The daily rhythm seems slow and relaxed. I follow a dirt road up behind some homes which leads to a beautiful hillside with yet another current of water flowing freely. The land must be very fertile in this valley with all the mountain water, and it is true that the village seems content in its natural richness, even if like many villages here, their economic situation is not easy. There is a trickle of tourism money that comes into the village, but Kyzyl Oi is not on the biggest tourist routes and despite the very genuine hospitality of villagers like Katya, visitors are rarer now that winter is coming. Leaving the village I headed south, and stopped briefly to explore a “city of the dead” on the outskirts. The Kyrgyz cemeteries are unusually elaborate affairs that really do look like small cities on the horizon from a distance. It is interesting because as a historically nomadic people they didn’t typically build permanent structures, but the oldest graves are built like small palaces of mud brick with intricate designs and complicated domes — almost as if the nomads put all their effort into constructing a final resting place. Many of these older tombs are now crumbling and in disrepair, and they are surrounded by more modern graves — some of which continue the tradition of elaborate construction while others are more discrete and simple in a modern style. The cemetery was at the base of a small black mountain near a bend in the river. Beyond the Kokoren Gorge stretched out in a ruggedly beautiful landscape of layered mountains. The road followed the river for a while before connecting with a bigger road that passed through a more populated area with a series of villages in a fertile valley. The road meandered through the villages changing character as it did — in one village it would be perfectly paved and level like a highway only to abruptly turn into a pot-holed obstacle course in the next village or a stretch of gravel and dirt. It seemed as if the state of the road depended on the wealth and political clout of each individual village. At one point the whole road was closed off forcing me to detour through the narrow dirt paths winding between homes and hoping that I would come back out to a point where I could intercept the road again. I had no detailed map of these villages and had to just follow general headings until I was able to get back to the road. When I reached the turnoff for Kara-Keche it was already mid-afternoon. The dirt road leading back into the mountains was a straight line, but it was heavily washboarded by the big trucks that went back and forth from the mine. At a certain point I could see a parallel set of tracks that looked like softer sand, and I cut off from the road to take the smoother track for as long as I could before the terrain forced me back onto the single road. Massively overladen trucks came barrelling down from the mine in a cloud of dust and I had to be careful. Once I reached the beginning of the switchbacks it was safer because the trucks had to go slower, and I took the time to appreciate the drive and marvel at the mysterious beauty of these raw rugged rock mountains. As I climbed I encountered the artifacts of the mining operation. Black coal dust rose in a cloud from the pit. Heavy trucks filled to overflowing with boulder-sized chunks of coal struggled to make it up the switchbacks. I used the time to stop and photograph periodically until we got to a safe place for me to pass and the truck drivers waved me ahead with a friendly smile. When I finally reached the top I could see down to the blue lake in the distance. The dark rugged mountains gave way to low rolling hills that seemed golden in the late afternoon light. It was a welcoming landscape of bright light and color after the blackness of the coal mine and I sped up a bit as I got closer.